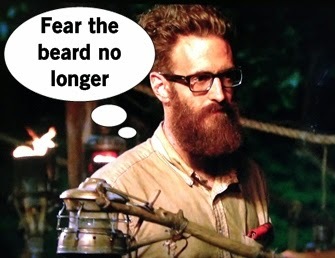 Survivor Worlds Apart: Drop Your Buffs, It's an Unbalanced Tribe Swap! The two hour spectacular kicks into high gear right away with a Reward Challenge. One caller guides a blindfolded pair around a course to retrieve various items, then work with a third blindfolded tribe member to lift the items to a call via a pulley. Much like every time I recap this classic challenge, there's shouting and a lot of people slamming into their stomachs and balls. 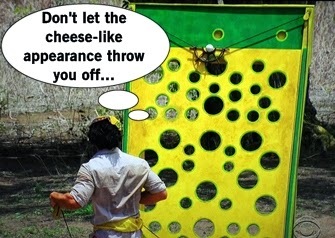 Now I'm pretty much tuned out of this challenge because it's redundant, but can't help but notice Probst telling everyone to be careful when dropping their pulley since they just let it flop down. After Sierra instructs her team to "drop it," it get too literal and the whole platform falls onto Kelley, knocking her down and making her head bleed. 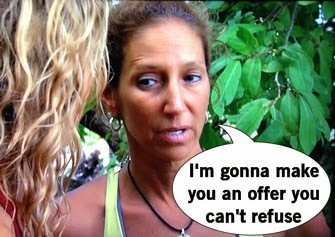 Probst immediately stops the challenge to bring in medical. Still blindfolded, Kelly is told by medical that it's just a big gash and she'll be OK with a bandage. The challenge goes on, No Collar wins chickens and roosters, White Collar win eggs, and the Blue Collar get nothing except for Kelley's stitches and an endless amount of guilt. Here's what is happening around the various camps. The No Collars are in celebratory mode with Nina gone, Will hopefully on their side, and chickens to eat. Jenn disagrees with the chicken slaughter, which gives her an ideal excuse to sneak away and search for the idol. Again using the "it's probably in a tree hole" theory, she finds the Hidden Immunity Idol. The White Collar tribe poaches their eggs, which leads to an interesting food discussion where Shirin reveals she slaughtered a rabbit in preparation for the show. Everyone is having Fatal Attraction flashbacks. The irritation with Shirin continues when Max doesn't want to sit her out of the next challenge so as not to hurt her feelings, which offends Carolyn instead and moves her target onto Max. And the Blue Collars won no food, so they kill and eat a snake. Rodney continues to polarize his tribe with chauvinistic comments that women have to hold themselves to higher standards than me. Lindsey gets fiesty, but Rodney thinks her face tattoo is a sign of problems. The Blue Collars are imploding. The Immunity Challenge has the whole tribe attached to a rope which is wrapped around various challenges, ending in lifting a ball up a wall full of holes. Not more pulleys! Save Kelly! Ok they're marionette pulleys so it's not so bad. No Collar and White Collar edge out victories and secure immunity. 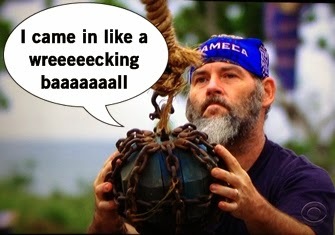 For the first time the Blue Collar tribe is heading to Tribal Council and given the volatility of the tribe the past few episodes, this should be a real shitshow. At this point, anyone on Blue Collar is fair game because they're all so annoying. Lindsey would like to vote out Rodney for his lack of respect for women, so Dan smiles and nods before relaying all this info. Apparently Dan, Mike, Rodney, and Kelly are a tight four, while Lindsey and Sierra are the outsiders. Did this confuse anyone else given the edit of the last three episodes? When more gross male comments come out of Rodney's mouth, Kelly and Mike question having Rodney around, especially since he's untrustworthy. Tribal Council time! The Blue Collars get the ol' "fire is life" ritual which is always heartwarming to see before the tribe begins to implode. Lindsey and Rodney both admit they don't mesh well together. "Chicken parmesan and tuna" is Rodney's analogy because he's eloquent. The women explain why Rodney offends them, and he does nothing to make the situation better as he reiterate his feelings about women needing to hold themselves to higher standards. You do you, tool. Lindsey explains she might get annoyed but is trying not to have hard feelings because she's Blue Collar strong and bonded to this group regardless of all the drama. 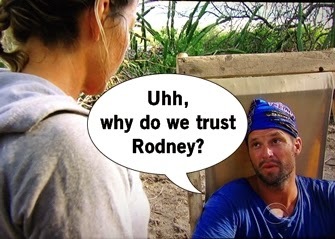 The tribe votes and it's a three way tie between Rodney, Lindsey, and Sierra - say whaaaat! 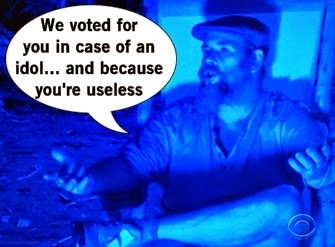 Mike, Dan, and Kelly have to re-vote and this leads to Lindsey being eliminated. The three tribes arrive at the Reward Challenge to a "surprise." Drop your buffs, it's a tribe shuffle! The yellow buff is dumped, leaving us with two tribes: Nagarote (red) and Escameca (blue). Everyone randomly draws new buffs and apparently the Survivor gods really love imbalanced tribes. Escameca is a physical powerhouse of testerone and Sierra, including all three men from her previous tribe (Dan, Mike, Rodney), Tyler and Joaquin from White Collar, and Joe the lone gun from the No Collars. Nagarote brings over Hali, Jen, and Will from No Collar, Max, Shirin, and Carolyn from White Collar, and Kelly is the only Blue Collar on the new tribe. They immediately head into another Survivor classic challenge to launch balls from a slingshot while their tribemates catch 'em with nets. Escameca easily wins a reward of kitchen equipment, sausage, and anything White Collar won (because RIP White Collar camp). Nagarote gives the camp tour and make introductions before the game kicks in. Being a "power trio" from White Collar, Shirin works on loner Kelly straightaway. But Shirin's charm quickly wears on her new tribe, full of singing, whistling, and TMI chats. Max gets two stingray stings and is treated by lifeguard Jenn to soak his feet in the water pot, and then everyone is grossed out that his plantars-wart-infected-feet has ruined the pot. Once again, Max and Shirin are on the outs and Carolyn is privately plotting their future blindside. The Escameca dudes are dumb enough to leave Sierra alone with her three new tribemates, and she spills the tea immediately on hating her former tribe. Mike suggests Dan apologize to Sierra, but Dan would rather give one of his long talks and run his mouth. Instead of "I'm sorry," Dan puts the blame back on Sierra because she said mean stuff too. Dan is the worst. The first Immunity Challenge with the new tribes has some cool medieval looking weaponry. Pots will be dragged on sleds through obstacles and then set up on poles. The medieval looking wrecking ball, wrapped in chains, is then swung to smash all the pots. There's no reason to attempt to recap this. The sheer physical strength of Escameca totally overpowers Nagarote, leading to an easy victory in the challenge and immunity. Max admits he wanted to smile after losing because he's ready to change the dynamic of the game. It's the worst voiceover comment to make when you're unaware that an ally is plotting your demise. Being the only Blue Collar there, Kelly is everyone's new BFF as they attempt to woo her to their side. Jenn/Hali would like to work with Kelly to vote off Shirin, while Max would like her to join him, Shirin, and Carolyn to vote off Will. Shirin tells Carolyn the plan, but doesn't really make it a conversation, so Carolyn decides she'd like to be the swin vote. Someone's pulling a Chaos Kass! Or a Sarah if it all fails. Jenn is so relieved to hear Carolyn wants to take out her former tribe, which then makes Kelly change her mind to be with the numbers. "It's a race for who's more annoying for me," Jenn says as her vote for who to blindside changes each minute. Tribal Council time! Shirin giggles while telling Probst about how much she loves her new tribe, gelling much better than White Collar. Max brings up the "inauthentic Kumbaya" as a way to pretend they have a chance, giving a long speech including major past Survivor trivia. 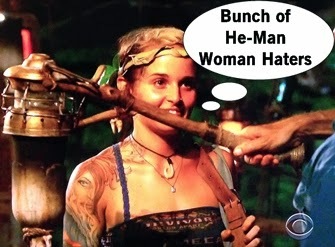 This is where I imagine Jenn's brain is melting as she attempts to grasp Max's superfan knowledge of the game. Max and Shirin are unapologetic superfans, geeking out on the entire experience. Hali brings up that sometimes the votes are moreso a "quality of life" vote, which is definitely a red flag comment. Everyone agrees tonight's vote will be a blindside. When it comes time to read the votes Max says, "Hold up bro" and for a minute it seems like an idol is coming up. Nope, just Max paying homage to the beautifully coiffed Malcolm moment of the past. It's a last moment of Tribal Council for Max as he is blindsided out of this game.